This is a British cuisine. Wow, Amazing! 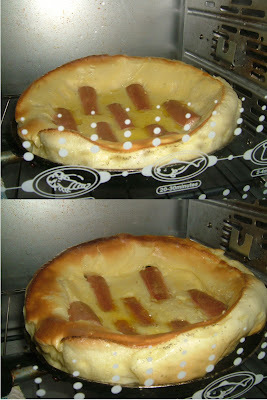 I thought pigs-in-the-blanket itself has already explained "Sausages-roll-under-the bun" , Toad-in-A-hole? Hahahahaha I just find out that we can named Sausage as Toad too! Haha! 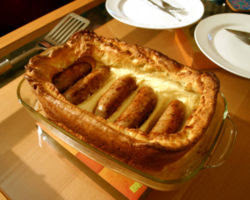 Toad in the hole is a traditional British dish comprising sausages in Yorkshire pudding batter, usually served with vegetables and gravy. 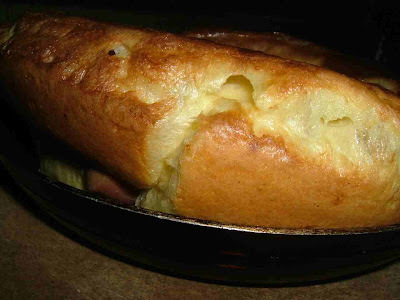 Well, When I look at the picture provided by Wikipedia, WOw... Looks like Dutch-Baby-Pancake ! 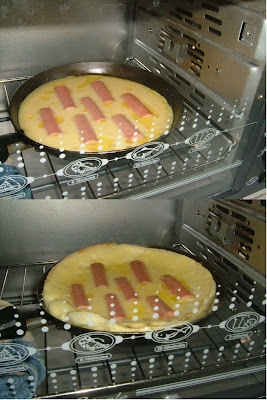 hahahahahha except the sausages. 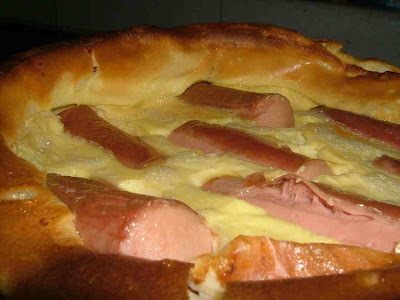 Well, I think that German Pancake are similar to Yorkshire Pudding... so, hence I used my own Dutch Baby recipe, replace all the sugar with Salt & add-on sausages on top! 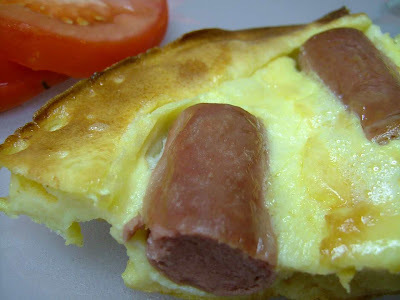 It was suggested that to use uncooked pork sausages, pan fried the sausage b4 bake . But, I don't care, I used cocktail hotdog! hahahaa , save my work & time ! 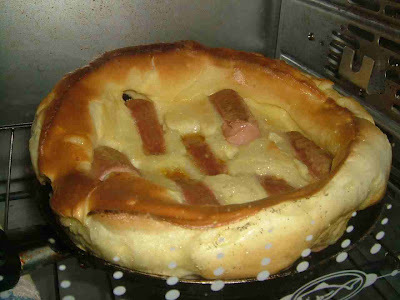 The origin of the name 'Toad-in-the-Hole' is vague. 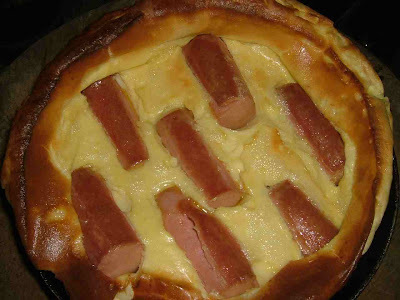 Most suggestions are that the dish's resemblance to a toad sticking its tongue out of a hole provide the dish with its somewhat unusual name.
. ... the minute the puff risen-up , I started to get excited again! HAhahahha..e e yerr!!! I can't wait to snap more of these! I did some research, originally it is to serve with cameralised Onion & Cabbage & Gravy or some green veges. Instead, I slice some tomatoes ! Alistair: *Giggle* Hey! I'm shocked after reading ur blog mate! U're really LUcky ! chicky, u're really good with eggs! when u gonna do a souffle?